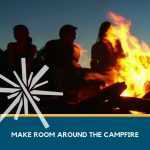 Gather your friends for Camp Fire Samish’s 13th Annual Dinner & Auction on Saturday, May 4th at the Swinomish Casino & Lodge, Anacortes. Silent Auction and cocktails begin at 5PM. Many items will be up for bid during the live and silent auctions. Discounted rooms are available at the Swinomish Casino. Call the Lodge directly by April 4th to make reservations. (855) 794-6563. Use code campfire19. Auction tickets are on sale now – use the link below or email auction@campfiresamish.org. Can’t attend but still want to support Camp Fire and Camp Kirby? You can make a Campership donation or RSVP as an absentee bidder. Click for more information and how to sign up. Best of Live Raffle is a raffle where the winner gets their choice of one of the Live Auction items. Only 120 tickets will be sold at $25 each. The winner does not have to be present to win. To have your logo and link listed on the web page, please email us. Sponsorship opportunities are still available! Please email us for details.